In the highly competitive news environment of today, it’s an absolute must for broadcasters to be able to deliver fast and high quality news to their audience. ChyronHego’s Camio Universe with Live Compositor & Live Assist playout automation integration enables producers and journalists to create more and better content and to attract viewers across all devices and platforms. With our tools, broadcast producers can build their graphics within seconds and respond to news as it breaks. The CAMIO Universe brings different islands together. From within the Newsroom Computer System, using an intuitive GUI, users can create a playlist by simply dragging & dropping the required elements into the rundown: camera cuts, robotic camera, clip playback, graphics, but also advanced layering, video effects and keying. All information is stored in the rundown, and fully automated CAMIO distributes all required assets and information to ChyronHego’s playout automation, Live Assist, to build the running order. Content producers don’t have to find assets manually or worry about player channel selection, which speeds up the workflow. Also, the risk for human errors is reduced significantly. True to the concept of Camio Universe, producers and journalists can focus on content creation and storytelling – instead of the underlying technology. Journalists can apply changes right before or even during the live broadcast, allowing for a 100% up-to-date rundown at all times, which is vital in a breaking news situation. With a full visual overview of the rundown, including the unique combination of playlist format and a timeline view, the playout operator is in absolute control of the production. For example, in the event of a breaking news story, it’s a simple task to quickly adapt the production by adding more reporters to work on the story, adding new video clips to the rundown, etc. Producers also have the option of having several different Live Compositors integrated with CAMIO. 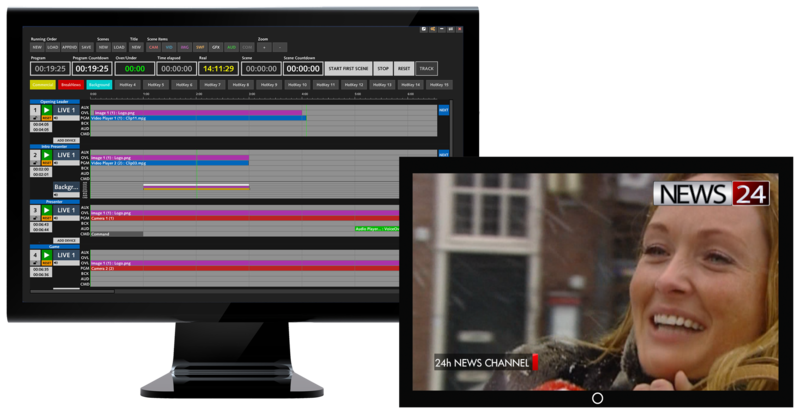 This enables the broadcaster to provide different outputs customized for TV, web, tablet and mobile, or to customize the output for different languages or regions by creating a different look and feel in the graphics. Create. Control. Broadcast. With CAMIO Universe, delivering fast and high quality content to your audience is as simple as that. Download our whitepaper to learn more about cost-effective, scalable, reliable and flexible news production. Mark Gederman is Sports Marketing Director with worldwide responsibility for ChyronHego’s sports broadcast, sports technology, and stadium production/in-venue experience solutions. Over the last 27 years, Mark has lead Customer Support, Training, Project Engineering and Marketing teams at leading broadcast technology and data storage companies, including Avid Technology, EMC Corporation, Grass Valley, and Chyron Corporation. Earlier in his career Mark worked in local television as a Broadcast Engineer and Producer.